The four leading candidates for governor in the Oct. 24 primary have revealed their views on a wide range of issues facing the state and nation. In this exclusive report, Public Service Commission member Scott Angelle, Lt. Governor Jay Dardenne, State Rep. John Bel Edwards, and U.S. Sen. David Vitter answered questions and provided insight into how they would approach the job of serving as Louisiana’s governor. 1. Will you oppose any and all legislation which would violate the United States Constitution or the Louisiana Constitution as written? 2. Should the Constitution as written be strictly followed or do you see it as a “living document” that should be more flexible and adjusted for modern times? ANGELLE: I hold an originalist view of the Constitution in line with Justices Scalia and Thomas. The Constitution is a timeless document that embodies the principles of freedom and democracy that define America. We should most certainly be wary of allowing judges to interpret its text in a way that creates or redefines rights that the Founders did not intend. The fundamental liberties it establishes are as true today as they were at the founding of our nation. I will fight every day to protect and uphold those liberties. DARDENNE: I am a strict constructionist. As Governor, I will follow the constitution and all laws of the land. EDWARDS: I have mixed feelings. For the most part, I agree with the Supreme Court approach that it has to be a living document. VITTER: Strictly enforced. The Constitution is not a living document. The words in the Constitution mean what they say. The Federalist Papers and other writings of the Founders clearly demonstrate the Founders’ original intent of the words they carefully chose to include in this document. The Constitution doesn’t create “rights” for individuals since these fundamental rights already existed naturally from our Creator and therefore pre-date the Constitution. The Constitution includes a democratic process for amending the text, whereas supporters of the “living document” theory believe that unelected, unaccountable and fallible judges can create new rights and change the meaning of the document based merely on the whims of the day. (a) Requiring proof of U. S. citizenship for all new registrations? (b) Requiring proper I.D. from all persons casting a ballot? (c) Requiring a good reason and proper safeguards for voting by mail? EDWARDS: Yes to the first three. As to online voting, perhaps someday there will be sufficient safeguards to make it possible but we’re not there yet. 4. (a) Do you support a return to closed primaries in state elections in Louisiana? (b) Do you support a return to closed primaries in federal elections in Louisiana? 5. Do you favor the death penalty for crimes such as 1st degree murder? EDWARDS: It should be at the jury’s option in the appropriate case. 6. Will you support the ban on Internet gambling? 7. President Obama repeatedly refuses to enforce federal law. Yet, he attempts to “make law” by using his power to issue Executive Orders. What are your ideas on how state legislatures can force Obama and the federal government to follow the law? ANGELLE: In Louisiana, we will not participate in any federal mandates that blatantly violate the constitution and the laws of the land. One example here is supporting “sanctuary cities.” As Governor, I’ll take actions with the legislature to do all within our power to crack down on sanctuary cities and enforce our immigration law. DARDENNE: If there is a clear violation of state’s rights from one of the President’s executive orders, the Attorney General should file suit. EDWARDS: Where there is federal overreach, the proper response is to file suit to stop it. VITTER: As Governor, I would aggressively attack over-regulation at the federal level by pursuing an aggressive litigation strategy with other states to block overreaching federal regulations. 8. Will you oppose any state or federal legislation or treaty that yields U.S. sovereignty in whole or in part to an international organization, nation or group of nations, or any public or private entity? EDWARDS: Yes, but I would need more information on the specific proposal. 9. Will you support strengthening Louisiana’s Public Records Act, in order to better protect the public’s right to information on state and local government and elected officials? 10. Do you see yourself as an activist governor who will take the lead on many controversial issues or will you react to the issues as they arise? ANGELLE: I see myself as a Governor who will unashamedly take the issues facing the people of our state head on and work with the legislature, education/business/community leaders and the people of Louisiana to find solutions that move our state forward. I won’t be afraid to stand up for what’s right, even when it’s not popular. DARDENNE: I will be an activist from day one. EDWARDS: I will be a pro-active governor, but you have to do both. VITTER: This is my last job elected or appointed. I’m running to take on the challenges we face head on with strong leadership and concrete solutions. 11. Will you support the 2nd Amendment and oppose any additional state or federal gun control? DARDENNE: Yes, more gun control isn’t the answer to gun violence. We need to better enforce the laws we have and strengthen our mental health records reporting system. VITTER: Yes, I am the only candidate for Governor with an A+ rating from the National Rifle Association and Gun Owners of America. I’ll fight to make sure our 2nd Amendment rights are fully protected. 12. Do you support strengthening Louisiana’s open carry law? EDWARDS: Yes but it depends on the specific proposal. I would not for example favor legislation allowing you to open carry on the property of someone who denies permission for you to do so. 13. Do you support Louisiana’s concealed carry law? 14. Do you support Louisiana’s Shoot the Burglar Law? 15. Will you oppose efforts by the state or federal government to monitor private communications by American citizens without a warrant signed by a judge particularly describing the person, place, and lawful reason for the search and seizure? ANGELLE: Yes. Law abiding citizens’ privacy should not be infringed without due process. 16. Will you oppose passage of the Equal Rights Amendment, which expired in 1982, and any legislation which suggests that it is still before the states? EDWARDS: Yes, this would not be the proper approach to passage. VITTER: The ERA is unnecessary because men and women are already equal under the law. 17. Will you oppose further infringements on the Right to Property? EDWARDS: Yes but I would need to know the specifics. 18. Will you support efforts to retain Louisiana law that marriage is between one man and one woman? ANGELLE: Yes. I firmly believe that marriage is between one man and one woman. I believe it’s a private commitment that serves an important public purpose. EDWARDS: I support marriage as between one man and one woman and co-authored the constitutional amendment to that effect, but it is unclear to me what options are still available. VITTER: Yes. I have coauthored legislation to protect states’ historic rights and role in defining marriage without encroachment by the federal government. 19. Will you oppose state hate crimes laws? 20. Will you oppose state legislation similar to the so-called “Fairness Ordinance” (rejected by the Baton Rouge Metro Council) which would give any special status or privilege based on sexual orientation? ANGELLE: Yes. I disagree with making a protected class out of lifestyle choices. EDWARDS: I cannot commit to saying I would oppose it without seeing the details of what is proposed. 21. Will you support Louisiana’s right to work law? 22. Will you support preserving a worker’s right to a secret ballot in union elections? 23. Will oppose the federal government’s Real ID Law? EDWARDS: No, I offered legislation to have Louisiana comply. 24. Will you support legislation to amend the federal Constitution to require a balanced federal budget except in time of declared war? 25. Will you oppose any and all tax increases? ANGELLE: Yes. I believe comprehensive structural budget reform must be a top priority. We need to cut all frivolous spending and end wasteful programs. The tax exemptions and credits we give out are often not producing the economic return on investment they promised. We must be more fiscally responsible and monitor those programs annually and ensure they are creating jobs and growing our economy. The gut reaction to raise taxes when we have a budget crisis is wrong and it won’t be how I govern. VITTER: I was the first candidate to announce that I would immediately call a Special Session to address wholesale spending and tax reform. I will pursue four central components of reform. First, undedicate much of the revenue in the general fund so that higher education and health care no longer have to endure death by a thousand cuts. Second, we would cut wasteful spending throughout state government and through exemptions, credits, and deductions. Third, we will actually reduce some tax rates once the budget is stabilized. Fourth, We will provide more protection for the transportation trust fund. Currently, only 11 percent of the funding goes to actual roads and bridges. The rest is siphoned off to balance the budget among other things. I’ll change that. In addition, we will eliminate the inventory tax. We will make sure that local governments have new streams of revenue. 26. Will you attempt to reduce the tax burden on married couples and small business? 27. Will you oppose reauthorizing a state inheritance tax? 28. How should the State of Louisiana address the projected revenue shortfall in the coming fiscal year? a) New or increased taxes? ANGELLE: I believe the solution to our fiscal crisis comes through cutting wasteful spending, addressing our under performing tax exemptions/credits and reforming our budget process and removing some of the dedications. We should also work on decentralizing state government because government works best when it is closest to the people. Just like Louisiana doesn’t wait on Washington to make us great, our 303 municipalities and countless small towns should not have to wait on Baton Rouge to make them great. I’d be more than happy to provide more details about these proposals upon request. DARDENNE: The Governor and Legislature unwisely used one time money, as well as an ultimate smoke screen — the SAVE ACT — to balance the budget. I will look first to credits, exceptions, exclusions and deductions as a means of making ends meet in this fiscal year. In reviewing spending, I will set real priorities and budget accordingly. I will not impose cuts simply across the board. I will prioritize spending and invest in programs that are efficient, that work and are beneficial to the state. EDWARDS: We’ll need a combination of both. But we should start by eliminating inefficiencies and tax expenditures. VITTER: See answer 25. State government still has plenty of waste to cut. 29. Will you oppose expanding Medicaid? ANGELLE: I will oppose expanding traditional Medicaid. But, as all other Republican candidates have said, I support coverage expansion with very strict terms. A stringent work requirement, a deductible and an automatic sunset provision if the funding burden changes. DARDENNE: As it is currently proposed, Yes. I will establish a task force to quickly review our options and make recommendations for a waiver to be submitted to the federal government. The waiver must provide for flexibility and protection if the feds fail to provide funding. VITTER: Yes, I will oppose Medicaid expansion in its current form. I would explore accessing additional federal funding that may be available but only if we’re reforming programs through a private coverage or other model, not expanding a broken, government-dominated system. 30. Will you oppose funding for community-organizing groups such as ACORN? EDWARDS: I don’t think we fund them now. I wouldn’t want to have a law that we couldn’t fund faith-based ministries, but it really depends on the specific situation or organization. 31. Will you insure that every state “entitlement” program includes a provision that able-bodied recipients be required to work as a condition of receiving the benefits? ANGELLE: Yes, I have made this an important part of my campaign platform. I’m currently running TV ads highlighting the importance of this issue. It would help solve a lot of our state’s fiscal problems. DARDENNE: Yes. The current requirement of just providing “proof” that you have applied for jobs is too lenient. EDWARDS: It should be required that the person be looking for work. 32. Will you oppose establishing a state minimum wage? EDWARDS: I favor Congress raising the minimum wage nationwide. Only if Congress fails to act would I favor it. 33. Will you support efforts to repeal laws and regulations which arbitrarily or unnecessarily restrict exploration for oil and gas, the use of fossil fuels, and the refining of petroleum products? 34. Will you support fracking? 35. Do you support broadening the definition of “independent contractor” so that businesses and individuals would be able to contract without automatically being labelled as having the employer-employee relationship, so long as the independent contractor files state and federal taxes? 36. Do you support repeal of Obamacare? EDWARDS: No but I do favor fixing portions of it. 37. Please explain the federal government’s modern role in the interpretation of the Commerce Clause and how it affects our economy in Louisiana. ANGELLE: I believe the federal government has grossly misinterpreted the commerce clause and used it as a tool to expand their reach and power through programs like Obamacare. VITTER: The Court’s recent ruling on the Obamacare case as it relates to the Commerce Clause is another perilous step forward by the Court to expand the power of the federal government to regulate nearly every economic activity, no matter how localized it may be. Now, a Louisiana rice farmer is subject to the coercive power of centralized government in Washington and his individual market decisions are prisoner to the macroeconomic effects of commodity pricing beyond his control. This expansion — with its genesis in the disastrous ruling in Wickard v. Filburn — distorts the Commerce Clause beyond all recognition and subverts the original intent of the Founding Fathers. (a) What, if anything, should the United States do in Iraq to help the Kurds and stop ISIS? (b) What should the United States do to oppose Islamic terrorism domestically and around the world? ANGELLE: The threat posed by Radical Islam is real, imminent and coming to a zip code near you if it is not addressed sooner rather than later. We must restore America’s reputation on the international stage as a defender of freedom and democracy. We must earn back the respect of our allies. Together, working with other freedom loving countries, we must push back against Radical Islam. I believe our nation’s military leaders are the best in the world at what they do. We must not take any options off the table and must be willing to make the tough decisions to defend the free world against the growing threat of Islamic terrorism. EDWARDS: We should do everything possible to stop ISIS in the Middle East. Here at home, we should step up our efforts to protect ourselves against terrorism. VITTER: a. Iraq is a perfect example of how Obama’s foreign strategy of leading from behind not only fails to carry forward hard-earning American victories, but also how extremists have been allowed to go unchecked until it is too late. I have voted in favor of the U.S. stepping up actions and involvement to stop ISIS’ deadly campaign. b. The current threat of global terrorism is on the rise due to a willful effort to say that terrorism was on the decline. In the past five years, our intelligence and national security budgets have been drastically cut while entitlement and social programs have been allowed to run rampant. 39. Do you favor using military force if necessary to prevent terrorist states such as North Korea and Iran from obtaining or building nuclear weapons? EDWARDS: I don’t favor a preemptive attack at this time. However, in the future, it would depend on how imminent the threat is and what intelligence we have on the situation. 40. EMT, or Electro-Magnetic Pulse, is a phenomena that occurs when a nuclear weapon is detonated above ground level. A high altitude nuclear explosion could destroy the electric grid and all computers, telephones, cell phones, electronic equipment, and motorized transportation for up to 1,000 miles, leaving Americans in the dark and without transportation or communication. The Congressional study on EMT estimated that within six months, half the American population would be dead. Even a single nuclear device in the hands of terrorists or a terrorist state, launched from a freighter off the East coast, could have these consequences. There is no need for a highly sophisticated missile system that can hit a specified target, only that the weapon be detonated at a high altitude. An EMT attack represents one of the most serious threats to American security. Will you support tax credits and/or funding necessary to harden Louisiana’s electric grid to protect it from EMT attack and prioritize other safeguards to make such an attack less likely and minimize the possible impact of such an attack? ANGELLE: I believe we must do everything we can to ensure our infrastructure is strong enough to withstand such an attack. As Governor, I will work with industry leaders, security experts and federal officials to do all we can to ensure the integrity of our electric grid. As a current member of the Public Service Commission, I am leading the fight on this issue. DARDENNE: No on tax credits because we have to review the tax credits we have now before we create any new ones. If such potential threat exists, I will do whatever necessary to protect Louisiana against such threats. EDWARDS: This is an issue that should be addressed nationwide. I need more information to assess how imminent this threat really is. VITTER: I would lead an effort to strengthen and protect our electric grid and other energy infrastructure to protect against the threats posed by storms, hurricanes, and natural and manmade electromagnetic pulse (EMPs) as laid out in my plan, Together, Louisiana Strong at davidvitter.com. 41. Do you believe the world’s climate is warming? If so, do you believe it is caused in part by human activity? Do you support controls on CO2 emissions? ANGELLE: Yes, I believe it’s warming though I am unsure of what is causing it. I am opposed to any regulations on CO2 without scientific proof that the regulations are addressing the root cause. DARDENNE: Yes probably in a small way. No to controls on CO2 emissions. EDWARDS: Yes it is warming and yes it is caused in part by human activity. My support of any controls on CO2 emissions would depend on what specific regulations are proposed, the costs required, and a cost-benefit analysis. VITTER: No, I do not support controls on CO2 emissions and as Governor I will not submit a plan t President Obama to ensure Louisiana’s compliance with such a clear overreach of federal authority. 42. Will you oppose any legislation that requires the Louisiana or U.S. to reduce its energy consumption, including a carbon tax, or Cap and Trade legislation? EDWARDS: Yes to opposing a carbon tax. but some regulations such as gas mileage requirements are the smart thing to do. 43. Free trade is a value that conservatives embrace, but free trade with dictatorial or Communist regimes serves to strengthen their ability to undermine liberty. In the case of Communist China, free trade has also served to destroy America’s manufacturing base, as Chinese government-owned and government-subsidized companies have captured market share, driving tens of thousands of privately-owned American manufacturers out of business. a) In recent years, Chinese government-owned banks have considered becoming the “private” partner in public-private partnerships in Louisiana, such as the Baton Rouge Loop. Under this proposal, the Chinese government entity would actually own and control the highway. Would you support legislation to prohibit Chinese government entities from participating in public-private partnerships in Louisiana and from owning any of the infrastructure of the state? EDWARDS: Yes, I am against foreign governments owning or controlling our infrastructure, not just China but any foreign government. VITTER: Expanding trade opportunities creates American jobs and allows for better opportunities with global markets. At the same time, we should work to ensure a level playing field and enforce our trade laws against frequent violators, especially China that abuses intellectual property rights and illegally dumps seafood and other products into our market. b) Two years ago, the Port of New Orleans proposed legislation to allow the ports in the state to be sold to foreign entities, including those owned by the Chinese Communist government. Will you support legislation which would prohibit our ports from being sold to such entities? 44. Will you support Country-of-Origin Labelling of all fresh food, which originates outside the United States? VITTER: I have an entire chapter in Together, Louisiana Strong on davidvitter.com on supporting Louisiana’s farmers and seafood industry. 45. Some Republicans say, “We must secure the border first and then adopt comprehensive immigration reform that provides a path to citizenship for illegal immigrants.” But other Republicans say that a promise of a path to citizenship for illegal immigrants guarantees that the border cannot be secured. Will you support securing the border, while opposing allowing illegal immigrants to stay in this country or having a path to citizenship? ANGELLE: Yes. We must secure the border and enforce the laws on our books. We can work to streamline the process to come here legally, but illegal aliens must go to the back of the line and enter our country legally. DARDENNE: Immigration laws need to be enforced plain and simple. I will fight against sanctuary cities and illegal immigration practices that endanger our citizens or place a burden on the taxpayers of Louisiana. EDWARDS: We need to look at the real world. We’re not going to deport 11 million people. But we should build the wall and we should not provide a path to citizenship. VITTER: Yes, I have led the Border Security and Enforcement First Caucus in the U.S. Senate. I’ll continue to fight for strong immigration enforcement and against the Obama Administration dumping the problem on Louisiana and other states. 46. Will you support strong criminal penalties for employers who hire illegal immigrants? 47. Will you support requiring all employers to use the rapid-response Internet system E-Verify to check employees’ Social Security numbers to insure the individual is not an illegal alien? EDWARDS: Yes, I sponsored legislation to require contractors to verify the legal status of workers. 48. Do you support returning illegal immigrants to their home countries? ANGELLE: Yes. As we ID illegal immigrants, they should be turned over to federal officials and handled within the confines of the law. EDWARDS: Yes, when we find them. However, we are not going to deport 11 million people. We should not deport people who are relatives of U.S. citizens. VITTER: Yes. One way to deter illegal immigration is stop rewarding it by allowing those who break our laws to stay in our country at taxpayer expense. 49. Will you support measures that ensure that persons here on temporary visas go home when their visas expire? EDWARDS: Yes, this is a federal issue. 50. Will you support construction of physical and electronic fences and National Guard troops along the border? 51. Will you vote to allow state or local officials to enforce federal immigration law within our borders? EDWARDS: Yes, in general, I favor it, but we need to be sure that it is legal. 52. Will you oppose automatic citizenship for “anchor babies” born to illegal aliens, including a constitutional amendment if necessary? 53. Since only U.S. citizens can vote, will you oppose using illegal aliens for purposes of apportionment and redistricting? EDWARDS: I don’t want them counted for apportionment purposes but we have to be careful because their presence does require costs to state and local government, and that should be taken into consideration. We can’t pretend they are not there. 55. Will you oppose the judge-invented notion that abortion is a constitutional right? 56. Will you sponsor all reasonsable legislation to restore legal protection for unborn children? 57. Will you oppose all government funding of abortion? 58. Should doctors who perform abortions be required to have admitting privileges at a local hospital in order to work in an abortion clinic? 59. Will you oppose all government funding for Planned Parenthood? EDWARDS: I’d like the current investigation to proceed. My understanding is that they are not performing abortions in Louisiana. I would not want their other work to close. We would need to provide alternative locations. 60. Will you support legislation to prohibit research that involves killing human embryos? 61. Will you support legislation to ban all forms of human cloning? 62. Do you favor reducing or eliminating the federal role in local public schools? ANGELLE: Education decisions belong at the local level. I support taking that power away from the federal government. DARDENNE: Yes, Education is best administered at a local level and being tied to mandates from the federal government harms our progress more than it helps. VITTER: Yes. That begins with demanding local versus federal control, and empowering the most important leaders on the front line — parents and teachers. 63. Will you oppose Common Core? ANGELLE: I oppose Common Core. DARDENNE: During the 2015 Legislative Session, Louisiana legislators agreed on a compromise regarding education standards. This compromise allows for Common Core standards to remain in place only for the upcoming 2015-2016 school year, giving Louisiana teachers, parents, and educational experts the time they need to establish Louisiana-based standards that will go into place at the beginning of the 2016-2017 school year. I don’t believe the federal government should be involved in the creation of education standards and curriculum — but I am for raising student achievement through higher standards. And that’s just what this compromise – which I have long supported and advocated – does. VITTER: Yes, I will lead us out of Common Core and into a Louisiana-based system of strong rigor, standards, and accountability by exiting Common Core/PARRC testing consortium immediately and adopting a rigorous interim test that is not aligned to Common Core. Convening a citizens panel of Louisiana parents, teachers, experts from higher education, and business leaders to develop an updated system of rigorous Louisiana standards and testing outside of Common Core. Requiring the new system to be developed, debated, and tested in a fully inclusive and transparent way. Demanding that the new system meet three tests: fully Louisiana controlled, not Common Core by another name, and objectively verified. Implementing it in a careful, methodical manner, until the rollout of Common Core. 64. Will you oppose nationalization of education by Common Core standards, assessments, tests, and Common Core aligned curriculum? 65. Will you support returning to neighborhood schools in public education? ANGELLE: Yes. I support public schools, private schools, charter schools and home schools. DARDENNE: Yes, but it appears that the courts have pre-empted any such support from actually returning to this status. 66. Do you support continuing to make the TOPS scholarship program available to qualified students regardless of family income? ANGELLE: Yes. I do not believe we should cap or limit TOPS in any way. 67. Do you support continuing in Louisiana law the Balanced Treatment Act which allows Louisiana school systems to provide balanced treatment of all sides in the origins debate. The Ouachita and Central Community School Systems currently utilize this law. VITTER: Yes, curriculum decisions should be made at local level. 68. Will you support the creation of the Southeast Baton Rouge Community School System? ANGELLE: Yes. I believe the residents in this area should be able to have their own school district, as do Central, Zachary and Baker. VITTER: I don’t know enough about the issue but I support local control of education and full autonomy in education. 69. Do you support the right of the voters of the proposed City of St. George to vote on whether to incorporate? ANGELLE: Yes. .I will always side with the right of the people to vote. EDWARDS: Yes, as long as the requirements of law are met. VITTER: Yes. I support the right to vote as laid out under current law. NOTE: The Republican candidates’ answers came from their responses to the East Baton Rouge Republican Party’s Endorsement Questionnaire. 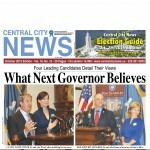 Rep. John Bel Edwards’ answers came from an interview with the Capital City News/Central City News.